Mr. Hansen was raised in Minnesota and joined the U.S. Marines in 1959 after graduation from high school. He served in the Marine Corps until 1963 when he moved to Sonoma County. He joined the Sonoma County Sheriff's Department as a patrol deputy in 1965 and during that time, also completed his Bachelor's in Political Science at Sacramento State University in 1968. Mr. Hansen earned his law degree from McGeorge School of Law in 1972. After serving in the Sheriff's Department for ten years, he joined the Sonoma County DA's Office in 1975 and was a prosecutor until he left to start his own law practice in 1979. 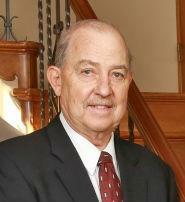 Following 25 years of successful practice, he formed Hansen & Miller Law Firm with partner Roy E. Miller in 2004. Mr. Hansen is married and lives outside Healdsburg. He competes in both bowling and golf tournaments on teams sponsored by the firm and Hansen & Miller Law Firm sponsors youth sports teams as well as FFA and 4H projects in Sonoma County.